Recently I compared two nice chromebooks. The Acer 720P and the HP 11. Both laptops sell for around $200. I ended up buying the Acer because it has a touchscreen, and the Haswell processor which has a long battery life. The HP 11 would have been a great choice too, because it is so lightweight at 2.3 pounds, and charges with a standard USB charger, which would have lightened my travel bag even further. 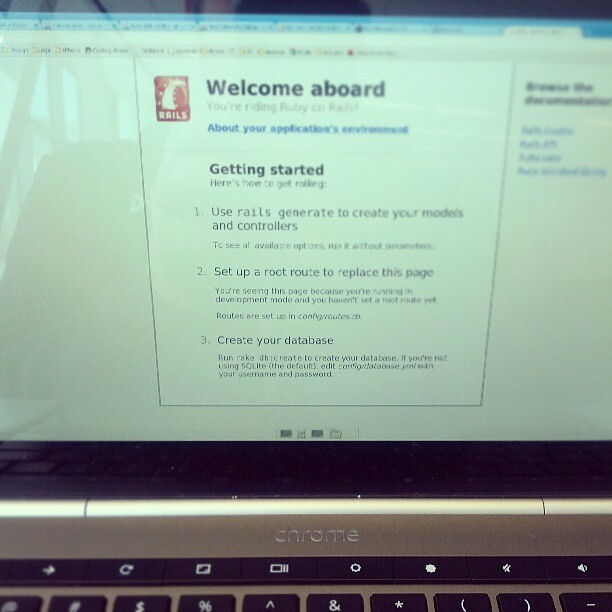 Since then I've been using the Chromebook as my main software development machine. There are two reasons this works. The best software now runs in the cloud. Cloud based Integrated Development Environments (IDEs) are the present and future of software development. You can even share configurations across multiple users. I work on some legacy projects where up to 80% of developers time is spent on configuring things like Environment Variables on the desktop. With the Cloud IDE, repeating this nightmare for every new desktop is a thing of the past. Fantastic utilities like Pixlr for quick graphic design, Google Drive for collaborative documentation, Trello for task management and Bitbucket for source control make cloud developers instantly productive and happier. Not every software project is on the cutting edge. When I need a specific desktop environment such as Windows, I rely on virtual machines to provide me that environment instantly. Amazon Web Services is the pioneer in making endless resources available to Software Developers. Their Free usage tier is a must for any engineer. VMWare, Virtualbox and Windows Azure have also begun to provide virtual machines (VMs) in the cloud. When it's time to play behind the scenes of the operating system, Linux is a frequent choice. Thanks to Crouton, You can now have an Ubuntu instance accessible from the Chrombook shell. I already have legacy java projects running on my linux instance. I work there when I don't want to utilize cloud resources. Linux is also great for running desktop software that can't be accessed from the cloud, such as the Kerbal Space Program, where I get to spend time above the clouds.